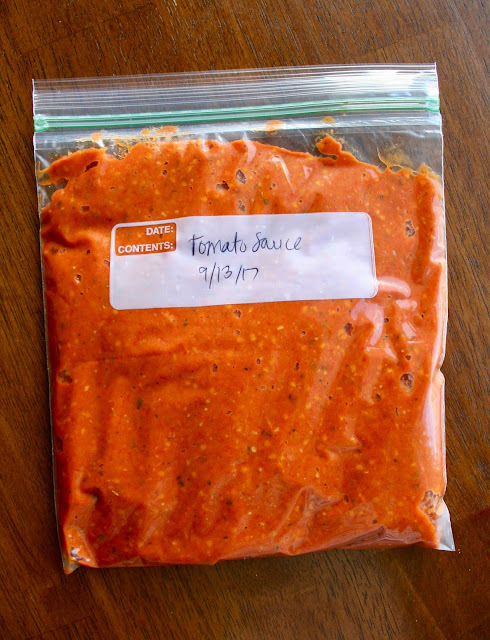 This recipe is thanks to those pounds and pounds of tomatoes my mom dropped off last week that I couldn't let go to waste. Not only did I make this amazing salsa, but I was able to make 2 batches of this INCREDIBLE tomato sauce. Then you blend it all in the food processor to make this thick and flavorful tomato sauce. Don't worry that it's thicker than what you're used to, it's normal and it will taste nothing like what you've had before, which is a good thing. This sauce is great on pasta and would be incredible as a dip for breadsticks. YUM. Also I recommend making a couple of batches because you'll want to save some for later. It's that good! 1. Preheat oven to 300 degrees F. Line a large baking sheet with foil. 2. Slice tomatoes in half or quarters, making them all roughly the same size. Chop carrots in half lengthwise and then into 1-2 inch pieces. Chop onion into 1-2 inch large pieces. 3. Place everything on baking sheet and drizzle with olive oil and sprinkle with salt and pepper. 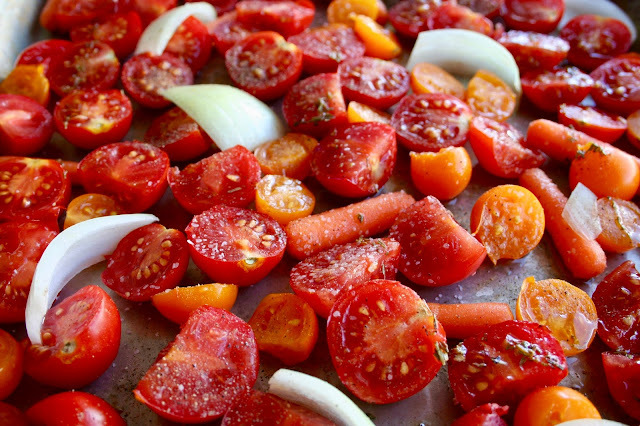 Arrange everything in a single layer, with tomatoes sitting skin-side down. 4. Cut top 1/3 of whole garlic head off and discard. Place garlic on a piece of foil and drizzle with olive oil and sprinkle with salt and pepper. Pull sides of foil up and secure. 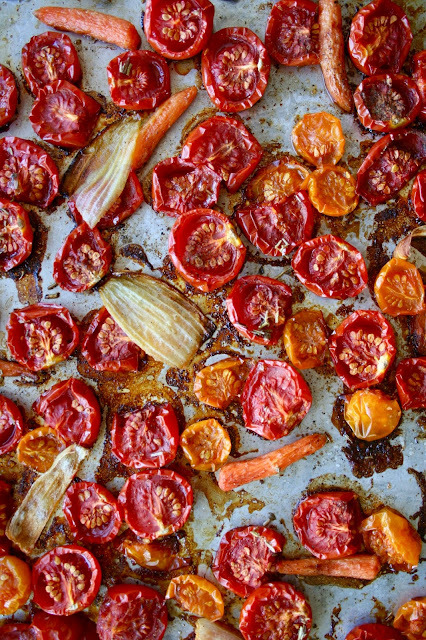 Place foil pack on baking sheet with tomatoes. 5. Roast in the oven for 2-3 hours, checking every hour, until everything is tender and tomatoes appear slightly shriveled. 6. Remove from oven and let cool slightly. Place roasted vegetables in a food processor with broth. Open garlic packet and squeeze all cloves into the food processor. Pulse several times and then add herbs. Pulse again until desired consistency is reached. Season with salt and pepper, add additional broth for consistency. If desired, add a little sugar or a drizzle of balsamic vinegar. 7. Let cool completely and then store in the fridge for a few days or in the freezer for several months. *This recipe can be adapted to use up whatever you have on hand. 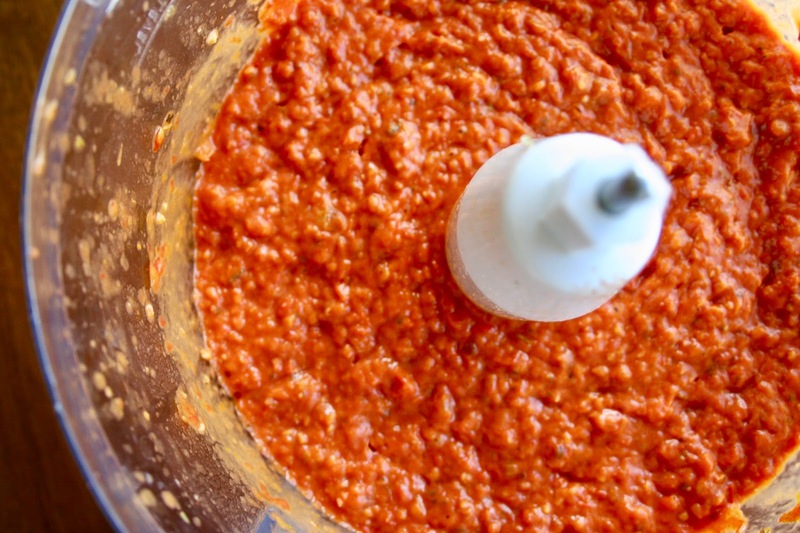 You can use just tomatoes if that's all you have and to make it even simpler, you can just add some minced garlic right before you blend the sauce instead of roasting a head of it.